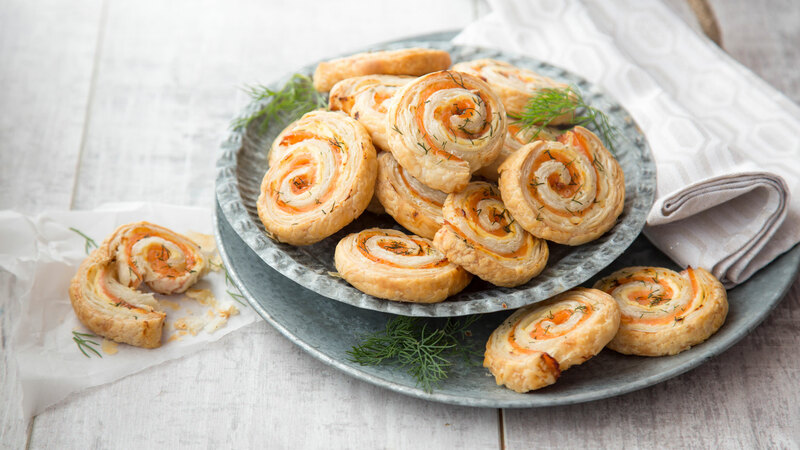 These smoked salmon pinwheels can be served as a canapé or starter with a nice mixed leaf salad. 1. Lightly dust a worktop with flour. Roll out the puff pastry into a rectangle. Spread a thin layer of cream cheese over the pastry. Cover with the sliced smoked salmon and sprinkle the chopped fresh dill on top. 2. Roll the puff pastry up tight like a Swiss roll. Chill in the fridge for 30 minutes. 3. Preheat the oven to 200°C/gas mark 6. Line a baking tray with non-stick baking paper. 4. Slice the puff pastry into slices 6mm thick and lay them out on the lined tray. Bake in the oven for 15 to 20 minutes, until golden brown and puffed up. Allow to cool slightly, then transfer to a serving platter.